Some of the iPhone users don't understand what it means to backup your iPhone. Is it identical to syncing the device? Here, in this article, we are going to clear the confusion. If you just wants to get acquainted with the same topic, this is also an article that you cannot miss out since we are going to tell you what backing up your iPhone does. Hence, get ahead with learning more about iPhone backup. Moreover, you all will also get aware of the most flexible way to backup and save your data for future. What Does Backing Up Your iPhone Do? Well, we came to know that a lot of users have confusions in their minds regarding the "Backup" and "Sync" features. Like, what does it mean to backup your iPhone or what does syncing iPhone mean? Don't worry, we are always here to resolve your confusions. Take a look here. 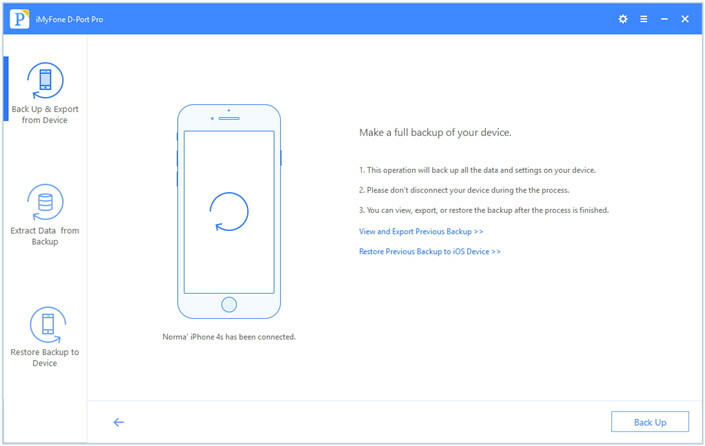 Backup – Basically, it's a snapshot of everything stored on your device and is used to roll back any wacky changes that made the device to act cranky. All the data and settings on your device will be backed up if you are backing up your iPhone. Sync – It, actually, is used to copy new data and information from one device (your iPhone) to other devices or to iTunes or iCloud. Also, performs the same action backwards, i.e. from other devices or iTunes or iCloud to your device. By default, Sync copies all the file types, but users have the flexibility to sync data selectively. For instance, simply toggle off the file types you do not want to sync and rest everything will be synced automatically. While performing backup with iTunes, latest version should be installed or else it may result in errors. Backing up your device with iTunes or iCloud is troublesome as you would have to make a full backup of your device even if you just want messages or any single file type to be backed up. The previous or old backup file will be overwritten when backing up your device with iTunes or iCloud. iCloud only provides you 5 GB of disk space to backup your data, which is quite very less. Users would have to pay a monthly fee to access greater amount of iCloud storage space. We are closing the theoretical section and moving to the more practical one. We hope you now know a little more about the question "what does backing up your iPhone do". If you have learnt the differences between syncing ang backing up and decided to backup your iPhone, let us help you more about the most recommended way to backup your device. You can use iMyFone D-Port Pro which is an ideal backup and restore tool for the users who are not much tech savvy since it is very simple to use. Plus, the most amazing part includes it flexibility, which means it can backup fully or selectively. Putting it simply, you can make full backup as well as backup a specific data type separately if you want to. Also, it is completely compatible with iOS 11. You can only backup messages, WhatsApp or WeChat instead of the whole data on your device. It can make backups without overwriting the previous or old backup files on your computer. 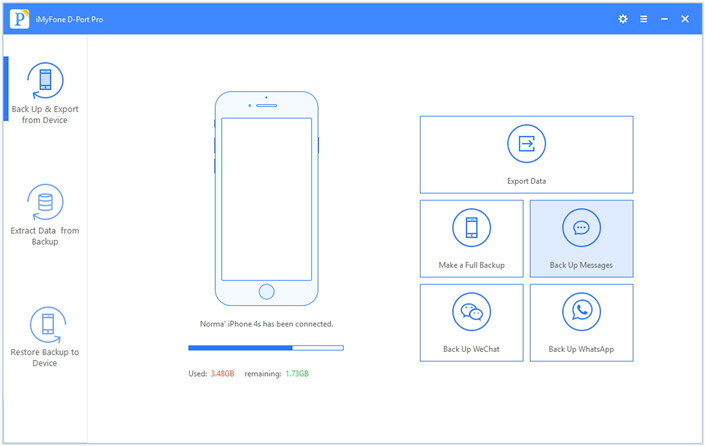 You can extract 20+ files from iOS devices or backup files made by iMyFone, iTunes, and iCloud. 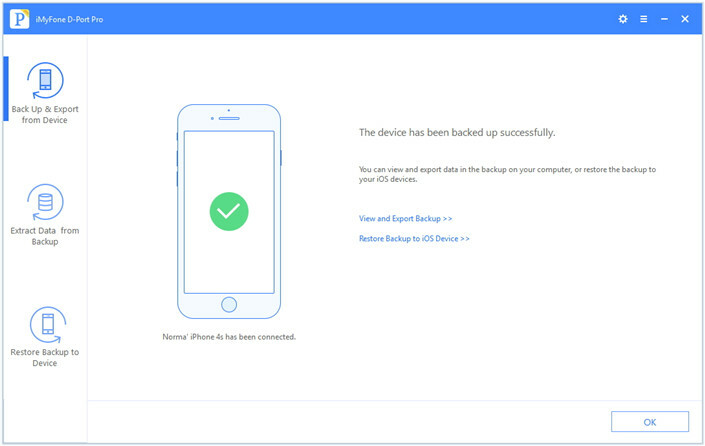 It also allows the users to restore data selectively from iTunes or iCloud or iMyFone backup to your device. 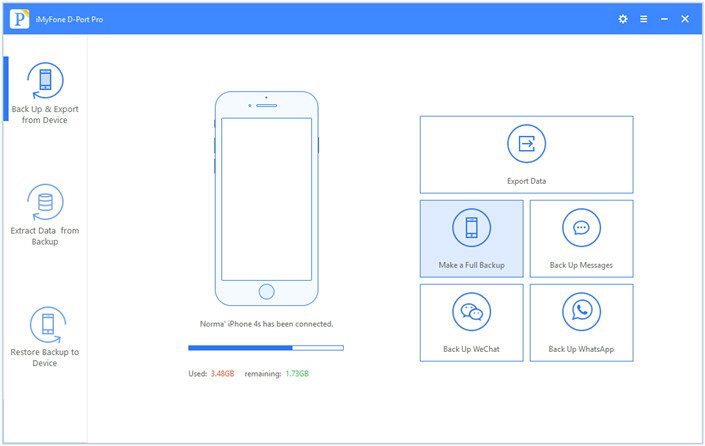 In this section, we will provide the full tutorial on how you can make a full backup of your iPhone using iMyFone D-Port Pro. It doesn't matter how much backups you make, this program never overwrites the previous backup. Let's now learn the guide. Before learning, just connect your iPhone to the computer and launch the program in your PC. Step 1 – When you open the program, three options will come on left panel from which you are required to click on "Back Up & Export from Device" and then on the right side, the upper panel says "Make a Full Backup". Just click on it and proceed to the next move. 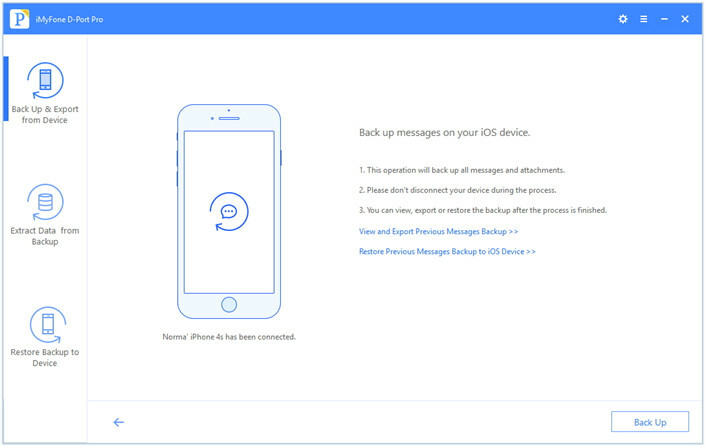 Step 2 – Now, just hit on "Back Up" to initiate the process and don't detach your device from PC. Step 3 – Lastly, when the process will be completed, you will get a notification. You can also backup your messages, WeChat or WhatsApp separately with iMyFone D-Port Pro and in this part, we will illustrate you the guide (taking the example of messages). If you want other data type, the process will be same; you just need to click the buttons accordingly. Again connect your device with the computer first. Step 1 – Open iMyFone D-Port Pro and select "Back Up & Export from Device" option from the left panel as we did earlier. Now, choose "Back Up Messages". Step 2 – After this, all you need is to press the "Back Up" button. Please ensure not to disconnect your iPhone from the computer. Step 3 – In the last, you will get the notification that your messages are successfully backed up. Now you have known the fact that backing up your iPhone saves your data in case of any future loss. We felt pleased to help you out and clearing your confusion and yes, also explaining you the best and most suggested way to backup your iPhone. We now hope that you all know "what does backing up your iPhone do". We appreciate the sharing of your experience.